Being lovers of trains and rail photography has both of us admiring O. Winston Link’s photography. He recognized that the era of steam was coming to end in the late 1950s and wanted to document its place in history with photography. He even went a step further and recorded the sounds of the last days of steam. He was also one of the pioneers of night photography. He set about capturing not only trains but the way of life in many towns built around the railroads. Since he was a commercial photographer he was able to gain access to schedules and time tables from Norfolk & Western that allowed him to truly document steam travel in the Appalachian mountains. He created his own lighting systems and spend his own money to create one of the best historical documentaries ever. How lucky we all are to benefit from those efforts. To learn more about him visit the O.Winston Link Museum in Roanoke, VA.
We had the pleasure of meeting his son, Conrad Link, at the Dedication of the Rural Retreat Depot last October. You can read about it in our photo blog – Rural Retreat Depot Preservation Leads the Way to the Future. One of O. Winston Link’s famous photos “The Birmingham Special Gets the High Ball to Rural Retreat” was taken there and they did a wonderful job of honoring his photography and recordings in their dedication! Rail photography has an important place in the history of our country. The Bluemoonistic Team is presently writing a book called “Mountain Rail Tales” that will document how railroad heritage still benefits many communities across the Appalachian Mountains today. Bluemoonistic photography will help tell the stories. It is an honored tradition that we are proud to carry on. The fact that the N&W No. 611 has been restored and is still operating excursions is a testament to how railroad heritage not only benefits the North Carolina and Virginia Transportation Museums but all of us! We saw all ages riding, watching and taking in this experience with steam travel. We met a 5 year old named, Cullen, who only wanted this train ride for his birthday, and 10 year old, Daniel, who already had a camera in his hand filming it all! The next generation of Railfans is alive and well and we thank all the folks that donate to Fire Up 611 to keep the steam rolling!! 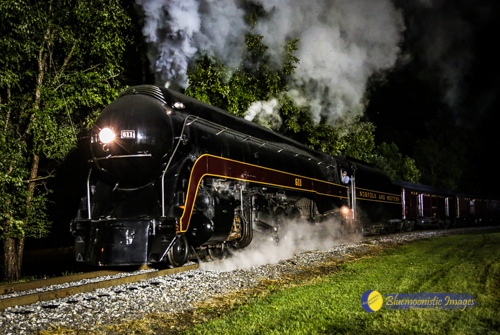 Our thanks also go out to both the NC Museum of Transportation and the #611 crew who staged such an authentic night time photo shoot. Our Bluemoonistic photos highlight the magic! Let us take you back to the 1950s and the era of steam travel in the US!